"The best part of living here is that it is just a five-minute walk to the beach. We walk to the beach every day," says Erin Scholnick-Lee, who lives in Da Nang, Vietnam. "Who doesn't want to live five minutes from the beach?" 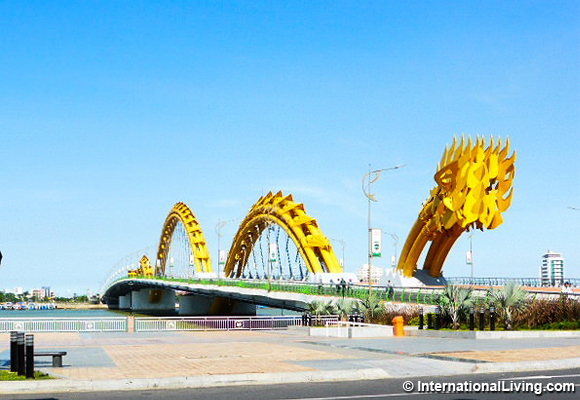 Vietnam has more than 2,000 miles of coastline--which means a lot of beaches to choose from. 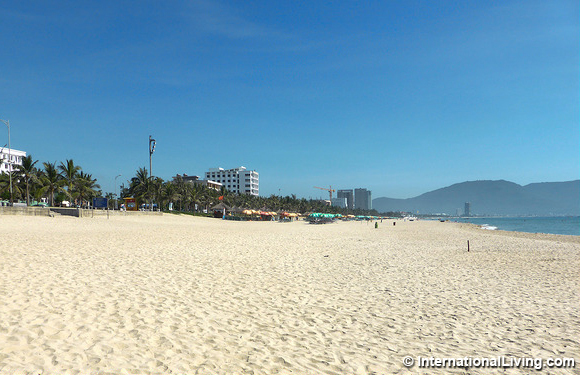 But Erin and her husband Ed think the beach in Da Nang is one of the best around. "The water is calming. The sand is soft. During the autumn and winter you have the beach to yourself. It really is like being on a deserted island," she says. "We have a spectacular view of the Lady Buddha at the end of the peninsula. She is glorious! She is over 200 feet tall and she's our guiding light." Erin and Ed also love Da Nang's low cost of living. They live on a quiet, residential street in the An Thuong neighborhood, on the east side of the Han River, which bisects Da Nang. They rent a one-bedroom, serviced apartment in a new building, and pay just $350 a month. That includes laundry, cable TV, water, WiFi, and cleaning three times a week. The only bill not included is electricity. Eating out is inexpensive and convenient, but "we try to eat out no more than once a day," Erin says. "But it's so easy to do that. A meal for the two of us, with one baguette and a rice bowl apiece, costs us just over $3. So it's really easy to eat every meal out if we don't want to cook at home. "Excluding our health insurance, the biggest part of our $1,200- to $1,500-a-month budget comes from taking taxis when it's too far to walk or ride the bikes, since we aren't comfortable driving a motorbike. 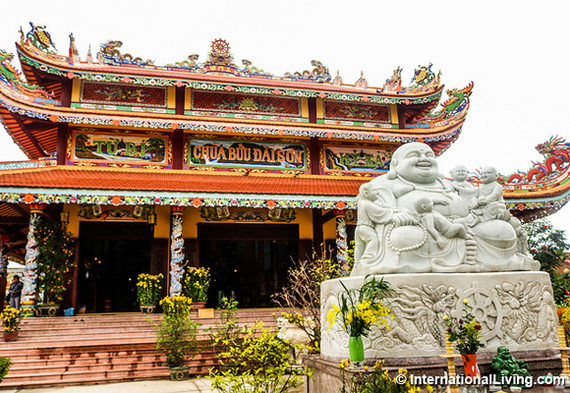 The bus service is supposed to expand to this part of Da Nang shortly, so we are very interested to see how that will work." Erin and Ed made the move to Southeast Asia just over a year ago. After spending a month in Cambodia and two months in Thailand, where they earned their TEFL (Teaching English as a Foreign Language) certificates, they decided to visit a friend of theirs in Da Nang. "The cost of living in San Francisco was just too high," says Erin of their decision to relocate. "And we wanted to live the life of travelers." They had never imagined themselves living in Vietnam. "It wasn't even on our radar! But once we came to Da Nang, we just knew that we could live here, and it was very easy to get work, too." They teach English two evenings a week. They spend the rest of their time enjoying the beach and all that Da Nang has to offer. "We wanted to keep working because we can, and we enjoy doing it," she explained. "We started teaching in September. We're not making a lot of money, but it pays the rent." The couple lives much like their Vietnamese neighbors. "The owner of our apartment supplies bicycles for their tenants, which we can use whenever we want. We enjoy riding the bikes to the local market, where we buy all our produce and meat. Everything we've seen there has been very fresh and clean." Vietnam has surpassed their expectations. "We didn't realize how easy Da Nang would be. We didn't anticipate how easy it has been to get around, to buy food, to go to the beach -- the things that make it so livable. Everything is so easy here -- it's remarkable. Vietnam has been so gracious, so forgiving, and so welcoming to us. We really do love it."